Folder Lock v5.9.0 is a fast file-security program that can password-protect, lock, hide and encrypt any number of files, folders, drives, pictures and documents in seconds. Protected files are hidden, undeletable, inaccessible and highly secure. It hides files from kids, friends and co-workers, safeguards them from viruses, trojans, worms and spyware, and even protects them from networked PCs, cable users and hackers. Files can also be protected on USB Flash Drives, Memory Sticks, CD-RW, floppies and notebooks. Protection works even if files are taken from one PC to another on a removable disk, without the need to install any software. It locks files in Windows, DOS and even Safe Modes. Additional Options include Stealth Mode, Hacker Attempt Monitoring, Shred files, AutoLock, Auto Shutdown PC, Lock your PC, Erase PC tracks, 256-bit Blowfish Encryption and Context Menu in Explorer. It is Windows Vista/2003/XP/2000/NT/Me/98/98S compatible and works on all kinds of disk types like FAT16, FAT32, NTFS. 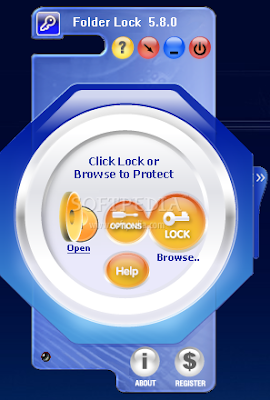 Folder Lock is the most downloaded file-security program in the market today.